Oh to knit like Kerenza Peacock plays the violin! Last night 6 of us went to see Sid Griffin and the Coal Porters who were playing a gig in Fairbourne, Gwynedd. And what a gig! I am no expert in the bluegrass style of music they play but I know enough to appreciate they are very, very good. I saw them last year when they played in Dolgellau just before their excellent fiddle player left the group to pursue her career in another direction. I looked forward to hearing her replacement. Bluegrass fiddle playing is something else, you have to be in real charge of the violin to get them tunes across. 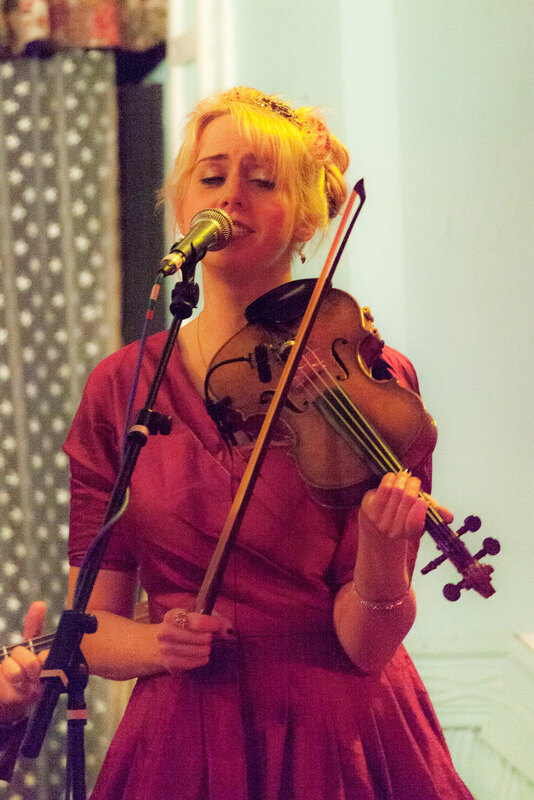 Kerenza Peacock (classically trained) is now playing fiddle with Coal Porters. Wow, are they a lucky group. She was beautiful to behold in a stunning cinch waisted cerise silk taffeta dress and heavenly to hear as she whizzed bluegrass style across the stings, creating rich textures of sound to die for. What an evening we had – and I got some knitting done the needles were whizzing along to the amusement of members of the band who saw my antics during the interval. Afterwards I managed a few brief words with Kerenza, who admitted, much to my joy, to having her own passion for the knitting needles. My evening was complete, a fellow knitter too! If you have the opportunity to hear Kerenza play you will understand my sincere wish to be able to knit as creatively as Kerenza Peacock can play the violin. Thank you Kerenza (and the other members of the band who were super too). Hi, Don’t know if you remember me. I came in the Wednesday after Easter. We’d been up to the Blue Lake in Fairburn and had received a phone call to say we were going to have our second grandchild. You were fantastic and showed me the blanket you knitted in the Katia Tobago which I loved. I have finished it and want to knit more with this lovely wool. Do you still have any left. The colours I had were 52, 53, 58. I like you feel quite sad that they have discontinued this wool. Hi Val, yes I do have some of that yarn left. Thank you for enquiring, I will send you an e-mail. Glad you are pleased with the result it truly is a yummy yarn to knit with.